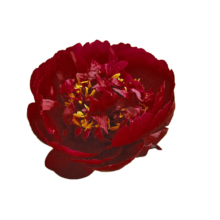 Buckeye Belle is a double-flowered peony with dark red petals. Fully bloomed, the centre of the red flowers are filled with yellow stamens, just like a shooting target. Bullseye! The burgundy Buckeye Belle is one of the darkest peonies in our assortment. This variety has sturdy stems and large buds that bloom to mid-sized flowers, 13 to 15 cm wide. Buckeye Belle is a creation of Walter Mainz, and was registered in 1956. Because of its mid-sized flowers, Buckeye Belle is a fantastic peony for a bouquet.